a day meant to promote women’s heart health. Heart Disease is the number one killer of women and is more deadly than all forms of cancer. On February 1st, Americans are asked to wear red in observance and honor of our national fight against this deadly disease. On February 2nd, the women of Central New York honored this national cause by attending the Strong Hearts, Strong Women Event in East Syracuse. The event intends to both educate women on the importance of heart health, as well as to honor survivors and celebrate the love and friendship among women. The event offers informational seminars and educational opportunities as well as support from retailers and healthcare providers in the community. University Hospital was a primary sponsor of the event, and asked Sunshine Friends, Inc. to join them in participation. University Hospital is one of many facilities that Sunshine Friends’ human and pet volunteers support with Pet Assisted Therapy. says Linda Martino, a long-time volunteer with Sunshine Friends. I have witnessed a patient in a hospital environment have their blood pressure lowered just after a visit with my dog Katie. Katie, a Westie, has also been a long-time volunteer with Sunshine Friends, volunteering at University Hospital, and has assisted many people in the community by bringing happiness to them during difficult times. Sunshine Friends’ human and pet volunteers attended the Strong Hearts, Strong Women event, and the pet volunteers were thrilled to meet women in the community and introduce them to type of therapy that Sunshine Friends offer. says Linda of Katie’s presence at the event. I had many people relate stories of their dogs and how happy their dogs make them feel. Tom O’Connell and his Golden Retriever Daphne have also volunteered at University Hospital over the years and attended the Strong Hearts event in support of the cause for women’s heart health. I think it’s important for Sunshine Friends to participate in this event as it allows us a way of reaching a greater audience, which hopefully will spread the word of the benefits of Pet-Assisted Therapy. 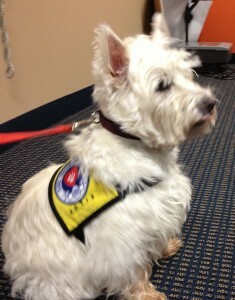 According to Tom, pet assisted therapy offers its own health benefits to its human volunteers. I think pet-assisted therapy would help give a person an outlet to become more active and to get out there with their dog, be it in the training or the visits themselves. Also to become more focused, and determined to become healthier. As we think about the importance of heart health this February, thank a pet you know for his support and love and give him some in return. You will both benefit.